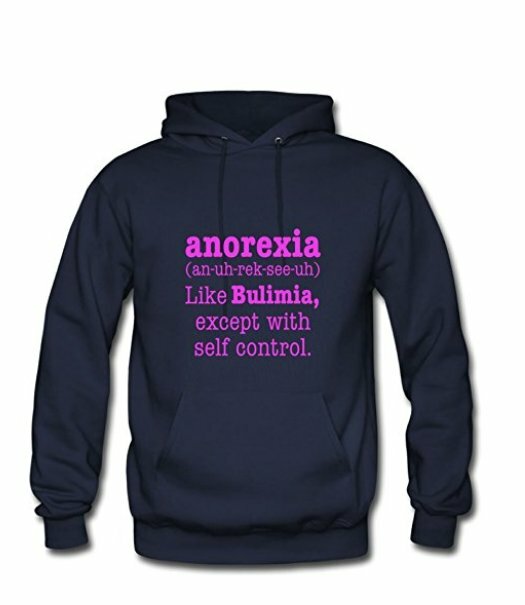 Amazon has caused outrage with a jumper that makes light of anorexia and bulimia. The £19 jumper makes light of eating disorders, by suggesting that anorexia is a more 'self-controlled' version of bulimia. As well as being hideously inaccurate and disgustingly insensitive, the jumper trivialises bulimia, and champions anorexia; two incredibly serious disorders which have the capacity to kill their sufferers. This makes me so sad. Anorexia silently kills a person on the inside and then kills their entire body. Take it down! That is awfully insensitive and horrible. Well done @DrAndyMayers for pulling them up on it! Amongst those leaving reviews are those who have suffered, know loved ones who have suffered and even those who have lost people to the disorders the jumper seeks to mock. Well bulemia is a very dangerous condition - and - having had both, Anorexia is *not* like bukemia with self control. Some people are seeking to justify the jumper as 'light humour', making the argument that if you're offended by it you just shouldn't purchase it. However, there is a very clear distinction between light or even dark humour and actively mocking very real, and very harmful mental disorders. The danger of commodifying eating disorders and normalising them by branding them on clothing is not a laughing matter, and has the potential to be incredibly dangerous. Hopefully the complaints are heeded soon, with a potential apology for any offence caused, too.